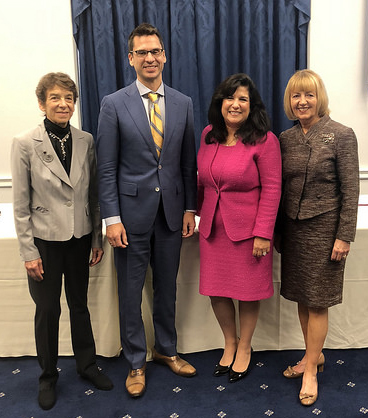 “Oral health is often overlooked and undervalued,” according to Research!America’s Director of Policy and Programs Sara Chang who opened a Capitol Hill briefing on the topic October 10, 2018. A panel of experts explored issues related to how oral health is connected to systemic health, the need for more research, and policy issues that can help increase understanding of oral health. Beth Truett, President and CEO of Oral Health America, moderated the discussion. “Oral health has been the subject of research for decades,” she said, “but today there is new recognition” of the role it plays in systemic health. “Many of the solutions needed to change lives begin beyond the (Washington) Beltway, beyond the statehouse, in the labs of researchers,” she added. “Many people think dental research is all about caries [cavities],” said Martha Somerman, DDS, PhD, Director of the National Institute of Dental and Craniofacial Research (NIDCR) at the National Institutes of Health, emphasizing that researchers at her institute are looking at issues ranging from cancers, pain, and rare diseases. “We imagine a world where dental, oral, and craniofacial health and diseases are understood in the context of the whole body,” she stated. The panel also discussed issues related to precision medicine, telehealth, access to dental care, and the importance of cross-disciplinary interactions. “It is not one of us but all of us that drives the kind of outcomes that we’re looking for: that oral health will be recognized as important to systemic health, and that people understand and enjoy a healthy mouth and a healthy body,” said Truett.